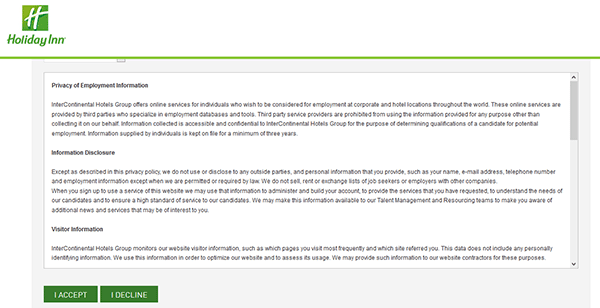 The Holiday Inn job application can be filled out and submitted online by going to the company’s careers website. The instructions posted below detail how to search for current openings, as well as how to complete the online application. It should be noted that there are printable applications available (but only for certain locations). Corporate, support, and hotel positions can all be applied for online. About the Company: Holiday Inn is an American hotel chain. The company has over 2,600 locations throughout the world. Holiday Inn was founded in 1952 and is headquartered out of Atlanta, Georgia. Step 1 – The first step of the online job search process is to go to the company’s main careers page. Click here to have the careers page load in a new tab/window. Step 2 – Scroll down and click the “Find Jobs” button/link and then select your location from the list of options (i.e. America or global). Step 3 – Scroll down the page to view the complete listing of current opportunities. If you want to search for specific openings, use the search form near the top of the list. Step 4 – Click the link of the job that you want to apply for. Step 5 – Read the description of the job and then click the link/button as outlined in the below image. Step 6 – Read and accept the privacy statement. Step 7 – Press the “New User” button to go to the account creation page. 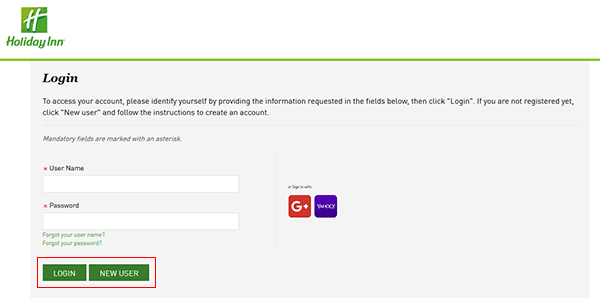 Step 9 – Click the “Register” button to create your account. You will be transferred to the main application form. Complete all sections/steps of the form by submitting the required details. After the form has been completed you will be able to submit it for processing/review.